AICAR is exercise in a pill for mice; the drug appears to give the couch potato mouse much more stamina. The drug appeared to change the physical composition of muscle, essentially transforming the tissue from sugar-burning fast-twitch fibers to fat-burning slow-twitch ones, the same change that occurs in distance runners and cyclists through training, according to research released Thursday. "You're getting the benefits of exercise without having to do any work," said David Mangelsdorf, a pharmacologist at University of Texas Southwestern Medical Center in Dallas, who was not connected with the research. 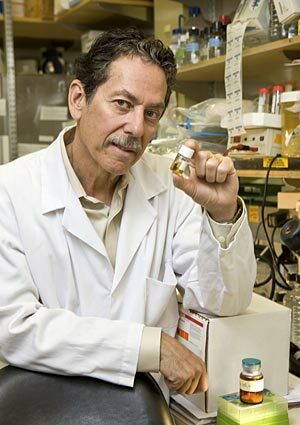 Ronald Evans, the lead researcher and a molecular physiologist at the Salk Institute in La Jolla, has been contacted by many athletes in spite of the fact that AICAR does not appear to work in humans at the kinds of doses that mice receive. Evans has already turned over detection protocols to the World Anti-Doping Agency in Montreal just in case. When sedentary mice were fed the drug daily for four weeks, they were able to run an average of 1,795 feet on a treadmill, 44% farther than mice that had received a placebo. Mice seem to get all of the great science for strength and stamina; see transgenic mice for details. Yet in spite of the fact that they had to bear their own full weight at all times, they were physically far inferior to the Americans. They lived lives of physical inertia, having machinery of every description for the performance of all labor, and convenient conveyances for any movement of more than a few steps. From AICAR: Scientists say they've put exercise in a pill; thanks to Moira for the tip on this story, and of course BajaB for the pointer to the reference.